Um, the only one THEY got wrong was #5. 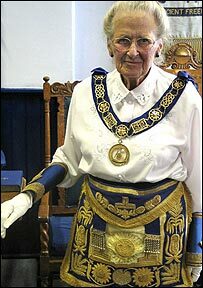 #5 A woman may not be a Freemason. 28.4% of people have also gotten it wrong. They should tell that to this woman! I missed that one, too. The right answer is false. The correct answer is true. Yeah, that is the only one I got wrong. Not a bad little quiz, I missed the Ben Franklin question. I knew that was a trick question so I got 100%.. ! If you become a registered user you can rate quizzes and keep track of your scores.